The fate of the diminutive Gill Building at the southeast corner of Seventh and Olive streets downtown has been in question in the past few years. 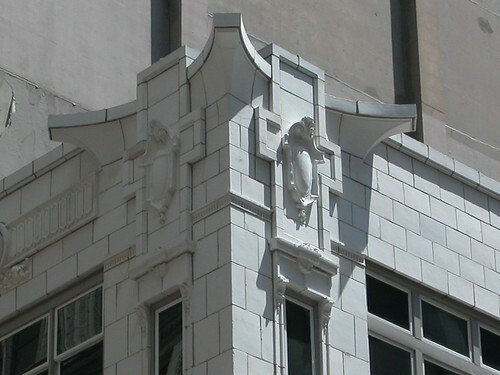 Originally built in 1910 and designed by St. Louis architect and builder Moritz Eyssell (but previously attributed to Kansas City architect Louis Curtiss, whose Boley Block is almost certainly the inspiration for this design), the building was part of a grouping of white Winkle terra cotta-faced building on the 600 block of Olive Street. Across the street remains the massive Railway Exchange Building, but gone are the Tower Building, the Erker’s Building and one other commercial building that comprised the district. In 1978, these buildings were included in the National register of Historic Places as the Olive Street Terra Cotta Historic District. At that point, the massive Famous-Barr parking garage already dwarfed the Gill Building. 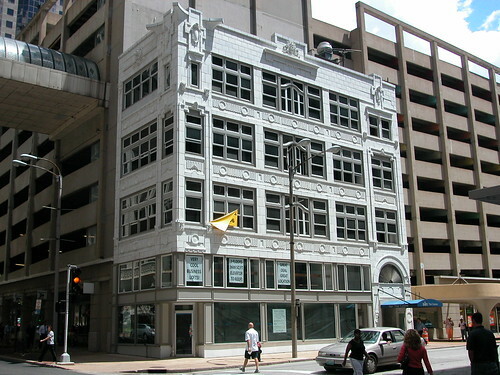 Jack Randall owned the Gill Building for years, maintaining an apartment on the upper floors. In 2002, May Department Stores abruptly closed Randall’s access to the fire escape in the parking garage (the only fire escape for the building, since the footprint doesn’t allow for an internal one) and started a protracted legal battle. Randall abandoned the building and put it up for sale. When May sold its assets to Federated Department Stores, I expected a new deal for the building — and that’s what came. The end result will be a consolation to those who have admired the graceful building. Delicate modernism — the curtain wall, the abstract ornament that avoids classicism — and the striking color create a building whose architectural power is greatly out of proportion with its small size. The Railway Exchange Building holds the eye, surely, but when you some upon this block the Gill Building gets the first glance. 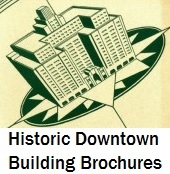 This entry was posted in Architecture, Downtown, Historic Preservation. Bookmark the permalink.